Today we are releasing Version 10.1, an update to our email archiving software. This time around, our developer team focused on making initial setup easier for IT admins by optimizing the configuration and making it more targeted. They also further optimized usability. Moreover, we ‘treated’ our software to a special feature that our customers have frequently requested: a regular status report. We introduced the status report feature in response to customer feedback. 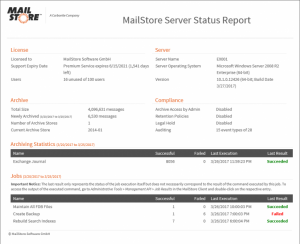 Many admins who use MailStore Server at their companies indicated that they would like MailStore to actively inform them of problems. We have introduced a corresponding option in Version 10.1 to meet this request – admins can now allow daily or weekly status reports to be sent to one or more recipients. These status reports contain all relevant data that the admin requires, from licensing details through to summaries of the successful or unsuccessful execution of archiving profiles or jobs. An additional feature provides administrators with even more protection against deliberate or unintentional breaches of compliance regulations. Instead of only logging changes, the software will now automatically prompt the admin to enter a password in order to confirm changes. Alternatively, the admin can also be prompted to provide a reason, such as a deletion process for emails from the archive, which will then also be logged. When it comes to our development work, our goal is to not only continually improve our products, but also to optimize them so that they are as easy to use as possible in everyday IT admin work. This particularly applies to initial configuration – read on for more details. Nowadays, the vast majority of email servers require login through an encrypted connection. HTTPS has been preinstalled for access to Exchange profiles for some time now. In order to complement this, we have changed the corresponding settings for all newly created IMAP profiles to IMAP-TLS. This significantly reduces the risk of unexpected errors occurring during initial configuration due to improper settings. MailStore automatically recognizes sent element folders in IMAP mailboxes. Moreover, the admin can now set MailStore to treat several folders as sent items folders. This is particularly necessary for mailboxes that are accessed from various or poorly configured email clients. Starting with Version 10.1, admins can not only test whether user synchronization with the directory service is successful, but also check whether the authorization is properly functioning. This is particularly helpful in non-Active Directory scenarios in which authorization frequently takes place via a second channel, such as IMAP login to the email server. The keywords ‘bcontent’ (body) and ‘acontent’ (attachment) have been added to the search function. This makes it possible to choose between searching through just the content of an email or just the content of an attachment. The user interface has been changed slightly to enable the use of the new search functions. Meanwhile, the entire search documentation is undergoing more comprehensive modifications, since it does not currently display all search options. Starting with Version 10.1, it will also be easier to search through individual folders within a folder tree. All users have to do is right-click the folder that they would like to search through in order to open a search screen. The latest version of MailStore contains the results of continuous security optimization, as well as increased backup efficiency – read on for more details. Backups that contain search indices require a great deal of time and storage space. This is because large portions of the search indices change even when smaller data volumes are archived, which means that nearly the entire index file needs to be transferred during backup. However, backups from databases contained in the archive storage and container files are comparatively small and can therefore be backed up quickly. Administrators can configure MailStore Server 10.1 in such a way that the search indices are excluded from the backup. This accelerates the process, making backups less time-intensive and therefore more efficient. Details about all the new features are available in the changelog.